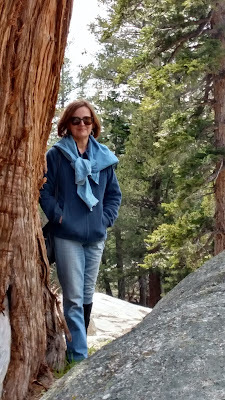 Since M is laid up with tendonitis in her heel, we're not doing a lot of hiking for now. Grrrrr. 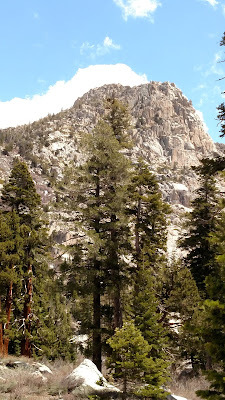 But that didn't stop us from driving up to Sonora Pass to take a look around today. The snow level is about 8500 feet on the North facing slopes, but 1000 feet higher on Southern ones. And the streams are plenty full of water. Here's a photo looking up from the 8000 foot level along Highway 108 today--not a snowbank in sight! 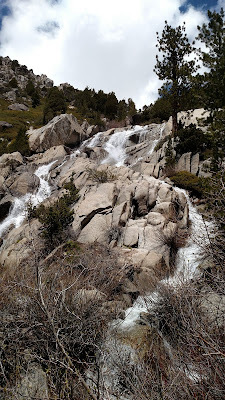 We'll post a link to the rest of the photos, including a short video of the cascade, when we get back on our desktop.